We are featured regularly on television, in print and on the radio. It’s A Wrap! has been featured on “The Oprah Winfrey Show,” “The View,” “Entertainment Tonight,” “Extra,” E! Entertainment Television, “Access Hollywood,” CNN, KTLA News at 10, KTLA Morning News, KCAL Lisa’s It List,KCAL Alan Mendelson’s Best Bargains, KCBS, KNBC, KNX, The Travel Channel’s “Hollywood Secrets,” Univision, Telemundo, Los Angeles Times, Los Angeles Daily News, Success Magazine, Elle Magazine, Glamour Magazine, Los Angeles Magazine, Triple AAA The Automobile Club of CA “Westways” and television, print and radio coverage in Japan, Mexico, Canada, England, Germany, Austria, Australia and more! 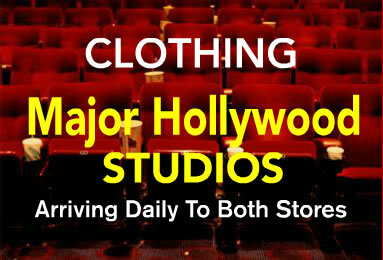 We are the only company on the planet that offers the general public the opportunity to purchase actual wardrobe and props from movie and TV sets, for sale in 2 huge retail stores, on our website and in auction. In 1981, co-owner and founder Janet Dion founded the production wardrobe and props sales concept. Since then we have established ourselves as THE resource to the Studios to liquidate wardrobe and props in volume. What does that mean to you? It means you can buy unique items, from casual to formal, at prices that can’t be beat! And where else can you buy clothing, furnishings or collectibles with a story to tell all your friends! Our goal is to provide our Studio clients an invaluable service, and our Customers a fun and exciting shopping experience. Please browse our site or come and see us in our Burbank and Beverly Hills stores! © It’s A Wrap! LLC . All rights reserved.